Indonesia's state-run Antara news agency has reported that the death toll from an earthquake that hit Lombok Island has risen to 347, however local officials put the death toll at 150. More than 70,000 people have been left homeless following the shallow 6.9-magnitude tremor. Local authorities said they had been forced to sleep in makeshift shelters and lack food, medicine and clean water. The quake triggered panic among locals and tourists on Lombok on Sunday, just a week after a tremor surged through the holiday island and killed 17. More than 200 people have been severely injured in the latest quake, with tens of thousands of homes damaged, and authorities have appealed for more medical personnel and basic supplies. "The number of victims keep rising. More than 70,000 people have been evacuated and tens of thousands of houses have collapsed." "We have limited human resources. Some paramedics have to be at the shelters, some need to be mobile," Mr Majdi said. 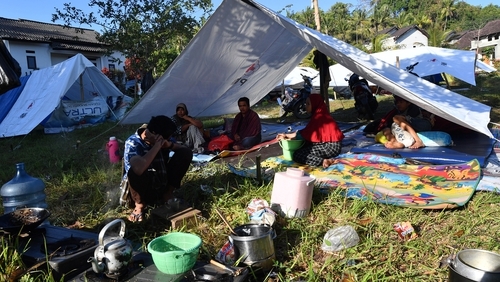 "It's typical of earthquake victims in Indonesia, they want to stay close to their livelihood, they can't bring their livestock to the shelters," Mr Hadi said. "Most foreign tourists have been evacuated," said Yusuf Latif, national search and rescue team spokesman.